mobile number anywhere in the world. 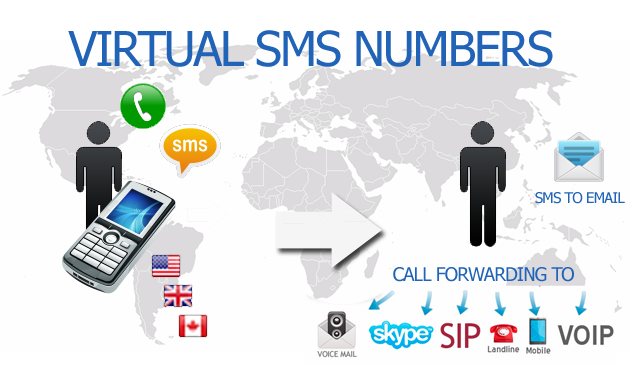 Telnum.net provides virtual SMS numbers in more then 25 countries. Virtual SMS number is represented in the code of one of the mobile operators and is provided as the separate service. This service is specially-designed for the people who face with huge amount of Text messages.Your mobile phone memory is not measureless and some time or other you will need to clear it.The problem can be solve by our Virtual SMS numbers. With using our numbers you will be able to receive SMS not only to your mobile phone, but to e-mail also.Buy now virtual local phone VoIP DID numbers with SMS to receive SMS (SMS to email/mobile). In nowadays international communication technologies we have a lot of innovations that helps you in our business life. Everybody knows about the possibility to receive SMS. But what if you need to receive a lot of SMS at a time? Do you have a business that requires receiving big amount of SMS messages? The problem can be solved by setting up virtual sms number and receive all incoming sms text. 1 - you can receive any amount of SMS to your email and arrange them in a way it is comfortable for your office. 2 - you can receive SMS without being there. You can buy a virtualsms number in one of those countries for your customers as if your office is there. You can be located anywhere in the world and receive SMS in any country eather. 3 - if you care about your customers give them virtual sms number in their country to save their money. How to buy a virtual SMS number?To buy virtual sms number follow the instructions. 1. Register on the site. Buy virtual local phone numbers - DID numbers - VOIP numbers, Toll free 800 numbers, Virtual Fax numbers , Virtual SMS numbers or multi channel virtual phone numbers worldwide with cheap international calls forwarding, FREE to SIP and Skype. Copyright © 2011 - 2018. All rights reserved. Telnum.net helps you to establish permanent local presence with a virtual local phone VoIP DID numbers.